Mold needs moisture in order to grow. Since your plumbing is what handles the flow of water (moisture) through the home, it’s often plumbing related problems, such as leaking pipes, taps, and showerheads, that result in the growth of mold. In addition to causing a higher water bill and bigger plumbing problems down the road, even “just a small drip” could be putting your health in jeopardy since it can lead to mold growth. That’s why it’s so important to fix leaks as soon as they are detected. Of course, there are also leaks that can go undetected for quite some time because they are hidden inside the ceiling or wall. If left undetected and untreated, mold can have many negative health effects. 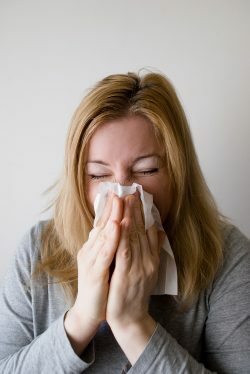 It’s possible to be experiencing the symptoms of mold without even knowing it since allergic reactions to mold cause cold or flu like symptoms such as coughing, sneezing, sore throat, stuffy nose, runny nose, headaches, itchy skin, watery, itchy, and red or bloodshot eyes. Toxic mold can cause symptoms that are much worse such as bleeding, internal organ damage, mental impairment, cancer, and even death. Mold infections can also happen to the elderly or other people with compromised immune systems. Mold infections are caused when mold spores are breathed in and the mold starts to grow inside the body. If you’ve experienced a plumbing leak and think it might have caused mold, you can buy a mold test kit and collect a mold sample yourself. Depending on the kit, the mold might be sent to a mold testing laboratory for analysis. Kits range from under $10 for the most basic kit to $50-$100 for something more advanced. Since mold levels can change, it’s best to test at different times and in different locations of the house. A DIY mold testing kit has its limits, though, and it’s always recommended to hire professionals, especially if you think the problem could be severe. When searching for professional help, always do your research and ensure that the mold remediation and removal service provider has the proper certification necessary to do the job correctly. A professional will ensure that the job is done properly, keeping your loved ones safe from the harmful effects of mold growth within the home. Since mold growth often stems from a plumbing problem, such as a water leak, it’s recommended not only to fix leaks as soon as they are spotted, but also to have a plumbing prevention plan in place to prevent the leaks from occurring in the first place. Many plumbers offer prevention plans that are much more budget friendly than dealing with the problems caused when plumbing systems fail.